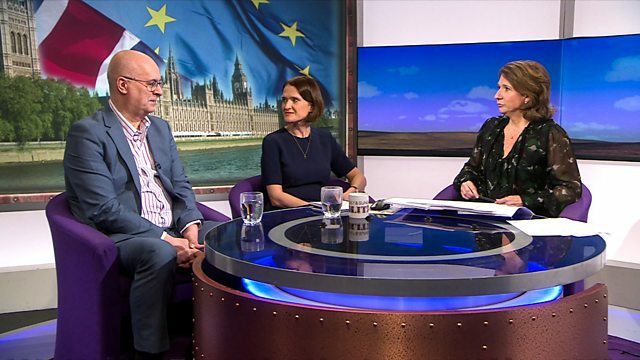 Jo Coburn with the latest news from Europe, including interviews with MEPs, reports from the European Parliament and a guide to the inner workings of the European Union. Now on BBC News, Politics Europe. stories in Brussels and Strasbourg. Ian Dale and Rachel Sylvester. draft text has now been to London. respect -- regret your decision. 25 countries. -- causing clocks. That's picked up after that. bullying Britain in any way at all. We would expect him to say that. just have priced it in. can look forward to in the future. Russia. We await the retaliation. terms of the stance against Russia? possibility that this also had this. I don't think we are afraid of them. unstable, and that is a problem. approach is important. It does work. number one story for the whole week. story in a small town in England. story in the European Parliament? is a big story, yes, indeed. Why? Brodtmann very own House of Cards. flags rather than in front of them. Brexit dinner in Downing Street. red -- transferred into his job. 100% suitable for this position. they all resigned en masse. powerful is he in this new role? have anything equivalent to this. in terms of a bureaucrat here. have met him, what is he like? yet it is powerful at the same time. to think are fair descriptions? under quite a lot of pressure. Russia will meet with a response. Constantine. Welcome to both of you. context. Are we missing digit joke? that is what I think is happening. you haven't in jokes before. crushingly. Are they funny at all? the Liberal Democrat press office. from an official British account? will be kind of enjoying it. should offer them your services! is for? To do this sort of thing?